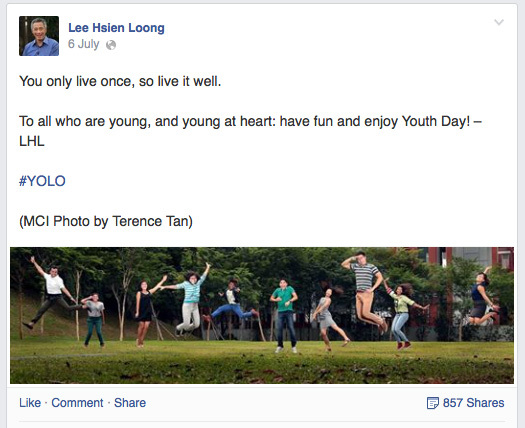 With every passing youth day, fewer and fewer people are getting to celebrate it. Maybe it’s because of our inverted pyramid population. Maybe it’s because the word “youth” is losing its meaning. The word “youth” to many is simply a demographic that you either flow in or out of, depending on the number of years you have walked this earth. The “official” definition of youth seems to be 7 to 18 years old and MOE’s definition of youth is one who is studying in either Primary, Secondary or JC institutions. I’ve passed the 18-year-old mark, but I still consider myself a youth. You see – I don’t believe youth is a mere segment, an age or an environment based on study/work. I believe it is a perspective and an attitude. When you say “youth”, some may associate it with immaturity. I beg to differ in opinion. It isn’t so much immaturity as it is a willingness to experiment, to try different things and think out of the box without fear of failure. This could be attributed to the notion that the conventional idea of “youth” (in terms of age), have more time on their hands and fewer commitments. Hence, they have less to lose. Indeed, all of us only live once (accurate at the time of publishing, I may be proven wrong, when I am, this article is rendered redundant). Take this chance to live life to the fullest. This might sound like a reckless rhetoric, and to some, an excuse for bad life choices, but then you need to take a step back and ask yourself how much public opinion matters to you and how much it should matter. Are you really “too old for this”? Increasingly, we hear the term “young at heart” when referring to someone who falls out of the “youth” age category. I think it’s a step in the right direction. What would you do if your bank credited your account with $1,440 every day? That would be nice, right? But, there’s just one small condition: whatever part of the $1,440 you didn’t spend each day would be lost. The bank would take back the unspent portion out of your account and it would be gone forever. Ok, that’s not likely to happen, is it? But we are given something that’s just as valuable. Everyday, like clock-work, we’re given something called ‘time’. Every day, all of us are credited with 1,440 minutes. We can spend those minutes any way we want. There’s just one small condition: the portion we don’t spend well or wisely is lost forever. There are no carry overs. Maybe youth day should be made a public holiday, it will be a day to remind ourselves that age is but a number and should not hinder our abilities. Do you remember when you were little and everything seemed so intriguing and you were curious about everything? For me, when I am curious about something, I have this unspeakable urge to learn about it or to learn that new skill. The days of learning outside of our obligations don’t have to be over because of age. Even when people say, “You how old already, still can learn what?” In your heart you will always know that the phrase “You can’t teach an old dog new tricks” doesn’t hold true as long as you are willing to try, as long as you believe that youth is a state of mind, not dependant on the year on our birth certificate. Youth day should be a day when we celebrate, regardless of age, the youth in all of us. The youth that thinks, tries, dares to be different.